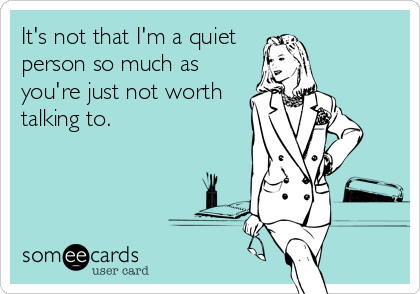 As other introverts will tell you, if we don’t like you, we just won’t talk to you. We’re not being mean, or rude, or insensitive, it’s just that we would rather spend our energy on people that are worth it. And we’re not spiteful or angry to the person we don’t like, we’re considerate and respectful, we just won’t talk to you. And if you’re full of drama? Oof! Forget it, double dose of not-talking-to-you. This leads me to confess that I have installed a countdown app on my phone which tells me exactly just how much longer I have to put up with a certain coworker. I wish that day was here already.